Vedic origin of a Kupala ritual? 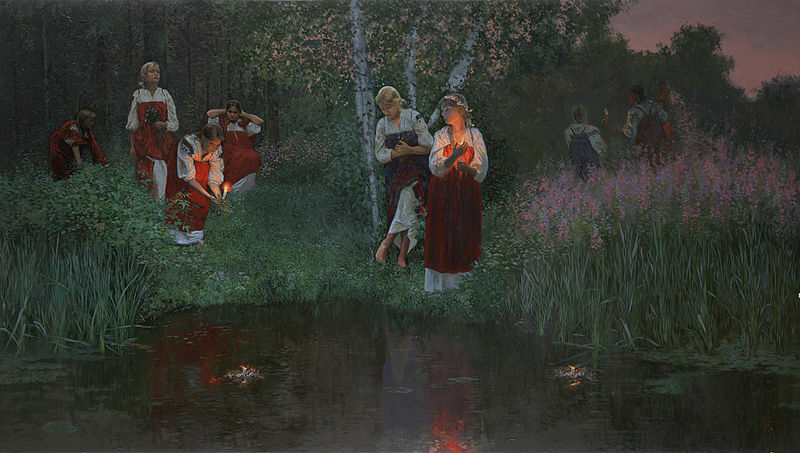 It is widely accepted that the Kupala celebrations trace their origins back into the pre-Christian Slavic societies. But what if some rituals were even older than the Slavic times? In any case, the meaning and significance of the ritual acts performed during these special days were blurred, distorted and obscured through the ages. Even though nowadays the practice of the rites and festivities of Kupala are mostly superficial, their meaning might not be entirely lost. I would like to share in this article a perspective on one of the many rituals occurring during the Kupala festivities. It addresses the tradition of (Slavic name?) the crafting of small rafts decorated with wreaths and lanterns or candles which are then set afloat on water. This understanding is provided from the 6th book of the Ringing Cedars Series, The Book of Kin. The following excerpts are part of a section entitled “Rituals”, which is itself part of the chapter “History of mankind, as told by Anastasia”. Quoted with the kind permission of the publishers at www.ringingcedars.com, here are but a few of the consciousness-expanding insights these books provide. For those who might still have trouble understanding how the young man who had been waiting on the riverbank could find with accuracy where the raft came from, some more explanations are given in this chapter. They have to do with the wick of the lampadka being an indicator of how long it had been alight, the well known speed of the river’s current as well as the unique characteristics of a fruit such as shape, colour, fragrance and taste. This entry was posted in Ringing Cedars and tagged celebrations, fire, kupala, rituals, vedic, water on October 7, 2014 by Olivier. 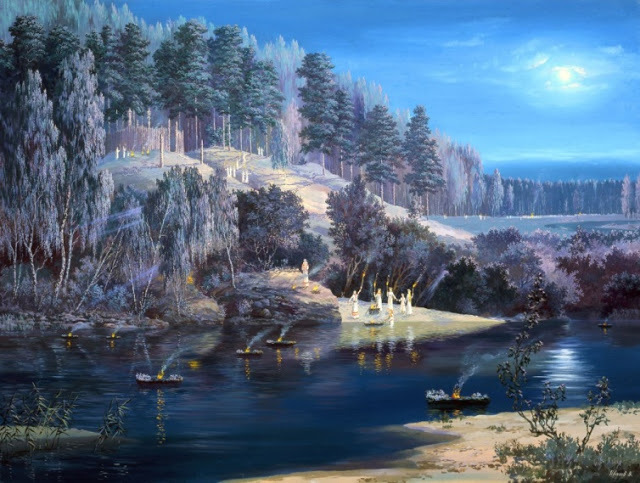 Here’s a very resourceful web address containing many papers on Slavic mythology in English. This entry was posted in Uncategorized on October 2, 2014 by Olivier. I would like to let the words speak for themselves here. You will find here lists made by Constantine Leo Borissof in which are juxtaposed the most obvious Russian – Sanskrit cognates verbs and nouns. As Anastasia (from the Ringing Cedars of Siberia) tells us, the Vedruss civizilation would have, in a very distant past, thrived on the lands of Siberia and maybe in a much wider area (don’t know to what extent, Eurasia certainly). For those who are unfamiliar with the term Vedruss (also spelled Vedrus) it is basicly a contraction of vedic and russian (Rus). There is evidence that some core elements of the vedic culture (based in the principles of Sanatana Dharma) were once long ago present on what is now the vast russian territory. What remains of this today are the artefacts and the intangible relics that we must bring to light if we are to really discern and understand our human story. I feel that becoming aware and consciouss of this almost forgotten era, especialy the way the people led their lives in these times, is something that can help us go through the crisis we are in. This entry was posted in Ringing Cedars and tagged language, russian, sanskrit, vedic, vedrus on May 22, 2013 by Olivier. Culture (Latin: cultura, lit. “cultivation”) is a modern concept based on a term first used in classical antiquity by the Roman orator, Cicero: “cultura animi”. The term “culture” appeared first in its current sense in Europe in the 18th and 19th centuries, to connote a process of cultivation or improvement, as in agriculture or horticulture. In the 19th century, the term developed to refer first to the betterment or refinement of the individual, especially through education, and then to the fulfillment of national aspirations or ideals. (2) the distinct ways that people living in different parts of the world classified and represented their experiences, and acted creatively. Hoebel describes culture as an integrated system of learned behavior patterns which are characteristic of the members of a society and which are not a result of biological inheritance. folklore, myths, epics, legends, tales, books, poems, riddles, traditions, beliefs, lore, use of plants, cuisine, celebrations, festivals, carnivals, rites, dances, chants, hymns, clothings, embroidery, jewelry, ornaments, architecture, carvings, city organisation, behaviors, rituals, ceremonies, mores, customs, norms, taboos, etiquette …and what else ? This entry was posted in Fundamentals and tagged anthropology, culture on April 14, 2013 by Olivier. 1. Usually, folks. ( used with a plural verb ) people in general : Folks say there wasn’t much rain last summer. 2. Often, folks. ( used with a plural verb ) people of a specified class or group : country folk; poor folks. 3. (used with a plural verb ) people as the carriers of culture, especially as representing the composite of social mores, customs, forms of behavior, etc. : The folk are the bearers of oral tradition. a. members of one’s family; one’s relatives: All his folks come from France. b. one’s parents: Will your folks let you go ? 5. Archaic. a people or tribe. 1. The body of knowledge, especially of a traditional, anecdotal, or popular nature, on a particular subject: the lore of herbs. 2. learning, knowledge, or erudition. a. the process or act of teaching; instruction. b. something that is taught; lesson. 1. the traditional beliefs, legends, customs, etc., of a people; lore of a people. 2. the study of such lore. 1. the unwritten literature of a people as expressed in folk tales, proverbs, riddles, songs, etc. 2. the body of stories and legends attached to a particular place, group, activity, etc. 3. the anthropological discipline concerned with the study of folkloric materials. This entry was posted in Fundamentals and tagged folk, folklore, lore on April 12, 2013 by Olivier.